The starting point for all camper vans is installing a leisure battery and split charging system.This 12v system can have the lights, fridge, stereo and other 12v accessories wired into it so you can have a home away from home without flattening your main battery. Installing a solar panel is fast becoming a must have piece of equipment. They PV cells or Photo Voltaic cell technologies are become more efficient with each day, this means more light energy converted in to usable electricity for your camper. 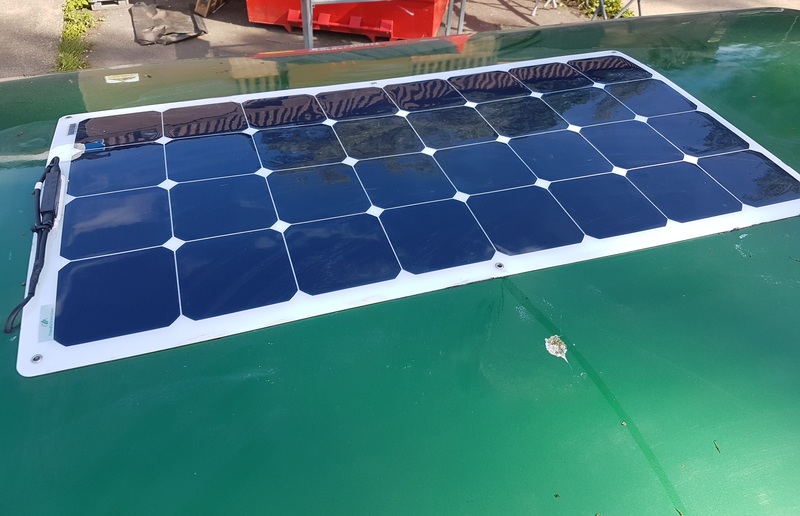 The efficiency of the panel does depend on the light level so they will be more useful in the summer months but they are active all the time there is some sort of light, so unless you park your camper indoors all the time, the leisure battery will always be undergoing conditioning, which is a vital process to maximise your batteries lifespan. We use up to date 120W flexible panels and the most up to date MPPT controllers for our solar installations meaning you might never need a hook up. Our price includes installation and wiring to your leisure battery.Larger capacity panels are available on request at additional cost. If you expect to be spending most of your time on a camp site and having a mains hook up is your priority then this installation is what you need to power heavy electrical equipment such as hair dryers etc. We can fit a 240v Hook up kit so you can enjoy your camping experience as fully as possible. If you still need to run a lot of your equipment from the leisure battery and either spend a lot of time on camp sites and don't want a solar panel installed, then a trickle charger might well be your best friend as it is designed to keep your leisure battery in tip top condition all the time you are on hook up. Meaning you don't need to keep switching between power source and can simply have your van wired up as a 12v only system and use the hook up availability for re-charging your battery instead of starting the engine up every couple of day. We install the latest in smart charge technology with this package. meaning the charger will only deliver what your battery needs to keep it healthy. "Off-grid" living may occasionally mean you will require a mains capable voltage (240v) for things like laptops and microwaves, but in the middle of nowhere, where does this power come from? Well a power inverter is the answer. Capable of using your 12v source (leisure battery) to generate a 240v power supply. The capacity of this power will depend on the size of the inverter which in turn dictates the cost of the installation.